Inventory We are a resale marketplace, not a box office or venue. Ticket prices may exceed face value. This site is not owned by War Memorial Opera House . The War Memorial Opera House in San Francisco was built in 1932 at a cost of $4 Million. Its sole purpose was originally to commemorate those who served in World War One and had a seating capacity of 3,146. Additionally there was standing space for 200 behind the orchestra. The United Nations had their first conference in this building. The Loma Prieta Earthquake of 1989 caused significant damage to the facility, and it had to be completely rebuilt. It reopened in 1993 as both a World War One and World War Two commemorative theatre and remains functional to the day. 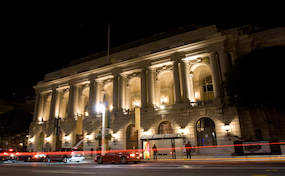 The War Memorial Opera House Box Office is located at 301 Van Ness Avenue, San Francisco, California. OperaHouseSanFrancisco.com is an independently owned and operated company that specializes in all online resale tickets in the resale secondary market. We are not currently affiliated with any official box office, website, and or venue. Ticket prices on our sites may be well below or above face value and can change quickly with market conditions. To order tickets to all War Memorial Opera House San Francisco events please follow the steps online through the checkout or call our operators for further assistance.